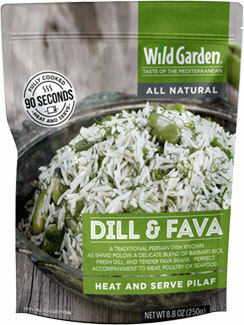 This hearty and convenient Persian dish known as shivid polow has a delicate blend of basmati rice, fresh dill and tender fava beans to make for a uniquely fragrant and tasty side dish. Fully cooked, it's ready in just 90 seconds in the microwave or a few minutes on the skillet, giving you a quick and convenient way to enjoy authentic flavors from across the globe any time. 8.8 oz. (250g) packages are $2.79 each.